As steel beams continued to rise at the new Bayhealth Milford health campus near Del. 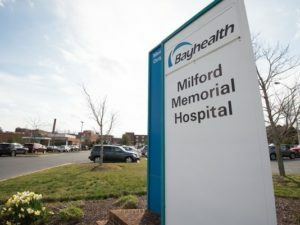 1 on Tuesday, plans for Milford Memorial Hospital on West Clarke Avenue were revealed. Nationwide Healthcare Services, based in Wilmington, will buy the 22-acre campus and turn it into an innovative multi-use healthcare-focused community, said Terry Murphy, Bayhealth president and chief executive officer. Murphy said the agreement follows through on a commitment Bayhealth made in November 2014 to find a buyer that could repurpose the property into a viable community resource after Bayhealth moves to its new health campus in early 2019. “Our community outreach revealed overwhelming support for a redevelopment plan that focuses on senior housing, skilled nursing care, assisted living and other health care-related services, all with the hope of attracting businesses that will create jobs for our community and provide continuity with our new health campus project,” Murphy said. Nationwide Healthcare operates two skilled care facilities in Delaware – the Regal Heights Healthcare and Rehabilitation Center in Hockessin and the Regency Healthcare & Rehabilitation Center in Wilmington. Nationwide President and CEO Meir Gelley said the relationship with Bayhealth was really formed during the first meeting. Delaware Lt. Gov. Bethany Hall-Long called the deal a healthy community initiative that will build a bridge for the area’s senior citizens. “As Sussex County gets a little more gray, this is an important venture,” she said. Construction of the new six-story, $300 million hospital and outpatient center is moving along. The first pieces of structural steel are in place, and beams can be seen from Del. 1 near Milford. Over the next few months, the 440,000-square-foot project will take shape along Wilkins Road and Cedar Creek Road. In total, 3,499 pieces of steel will be used to complete the project – 5,497,696 pounds of steel, according to subcontractor Crystal Steel Inc., based in Delmar. The campus is expected to open for patients in 2018 and will house 163 single-patient rooms, increased emergency services, cardiovascular services, additional operating rooms and all private patient rooms. There also will be a 70,000-square-foot outpatient center connected to the hospital. Population experts estimate that by 2030, the aging population in Sussex County will double. Murphy said the new hospital would be able to accommodate the need for additional geriatric physicians and more specialty programs tailored to the Medicare-ready population. Bayhealth Medical Center has been in downstate Delaware since the early 1920s. Health officials opened Kent General Hospital in Dover in 1927 and Milford Memorial Hospital in 1938.